Domaine de la Cote de l’Ange only dates back to 1972 when the domaine was founded by Jean Claude Mestre and Monique Jeune. The Jeune family were quite experienced as growers and winemakers in the southern Rhone as the family had previously owned the well regarded Domaine Monpertuis. Domaine de la Cote de l’Ange produced their first vintage in 1974. The property has remained in the hands of the same family and is managed today by Yannick Gasparri and Corinne Gasparri. Domaine de la Cote de l’Ange owns 13.5 hectares of vineyards in Chateauneuf du Pape and an additional 2.5 hectares of vines located in the Cotes du Rhone appellation. 1.5 hectares are devoted to the growing of white wine grapes. The remaining 12 hectares are used in the production of red Chateauneuf du Pape wine. Domaine de la Cote de l’Ange produces three red wines and one white wine in Chateauneuf du Pape. wine. Domaine de la Cote de l’Ange Tradition is made from a blend of 70% Grenache, 10% Mourvedre and 20% Syrah, but that can vary, depending on the vintage. The terroir is rocks, pebbles and limestone. The grapes are 100% destemmed. The wine is aged in a combination of old foudres, tank and from time to time, a small amount of older, French oak barrels. On average the production is close to 2,200 cases per year. Domaine de la Cote de l’Ange Vieilles Vignes is produced from 80% old vine Grenache and 20% Mourvedre. The vines are on average more than 80 years of age. The terroir is pure rocks and stones. The Grenache is aged in mostly large, old foudres and tank. The Syrah is aged in used French oak barrels. Not much wine is produced. On average, the production is close to 400 cases per year. Domaine de la Cote de l’Ange Secret de l’Ange was produced for the first time in 2007 and was made from a blend dominated by up to 80% old vine Mourvedre that is blended with 20% old vine Grenache. However, the blend can vary with some vintages having a lot more Mourvedre. The wine is aged in French oak barrels for between 14-16 months. Domaine de la Cote de l’Ange Chateauneuf du Pape Blanc is most often a blend of 30% Clairette, 30% Bourboulenc, 20% Roussanne and 20% Grenache Blanc. The wine is aged in a combination of steel tanks and new, French oak barrels, the production is close to 350 cases per year. Domaine de la Cote de l’Ange can be enjoyed on the young side. Young vintages can be popped and poured, or decanted for about 1 hour, give or take. This allows the wine to soften and open its perfume. Older vintages might need very little decanting, just enough to remove the sediment. Domaine de la Cote de l’Ange is usually better with 2-4 years of bottle age. Of course that can vary slightly, depending on the vintage. In the best vintages the wine should be consumed within 4-12 years after the vintage. Domaine de la Cote de l’Ange is best served at 15.5 degrees Celsius, 60 degrees Fahrenheit. The cool, almost cellar temperature gives the wine more freshness and lift. Domaine de la Cote de l’Ange is best served with all types of classic meat dishes, veal, pork, beef, lamb, duck, game, roast chicken, roasted, braised, stewed dishes, sausage, barbecue and cassoulet. 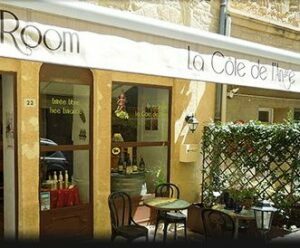 Domaine de la Cote de l’Ange is also good with Asian dishes, hearty fish courses like tuna, mushrooms pasta, eggplant, tomatoes and cheese. The white wine of Domaine de la Cote de l’Ange makes a perfect wine and food match with shellfish, fresh seafood of all types, veal, pork, chicken and cheese. From 2.5 hectares of vines, Domaine de la Cote de l’Ange also makes a Cotes du Rhone which offers great value. Medium bodied, forward, lush, polished wine with ripe, sweet, fruits and hints of coffee, thyme and cherries in the mix. The plushly textured wine was made from blending 65% Grenache, 25% Mourvedre and 10% Syrah. This is a big leap up from previous vintages. Powerful, intense, full bodied and spicy, with loads of fresh, spicy, peppery fruits and spice. Tannic and demanding time, this will gain in complexity with time. But due to the large amount of Mourvedre, 80%, followed by 20% Grenache, this will age really well. I liked the style here and find this to be a interesting wine that needs to be tasted. Rich, fat juicy fruits, ripe, but powerful tannins and a blast of dark, juicy, fresh, ripe red berries and herbs in the finish. Full bodied, lush and intense, the wine has length and complexity that will be improved with some time in the cellar. The wine was made using a blend of 80% Grenache and 20% Mourvedre. Forward, early drinking, medium bodied wine with a spicy, incense, coffee, thyme and cherry kirsch core of fruit. The round textured wine was made from blending 70% Grenache, 15% Syrah and 15% Mourvedre. Light, bright and simple, with a crisp red fruit character and some garrigue that will be best tasted young. With loads of fresh, spicy, peppery berries, jam, spice box, licorice and garrigue notes, this is full bodied and concentrated. The wine is deep, spicy, rich and mouth filling. With one of the highest portions of Mourvedre in Chateauneuf du Pape, this is a truly serious wine that needs to be tasted. Intense blackberry jam, licorice, black cherry, espresso bean and spice are found in the aromatics. Ripe, fat, concentrated and full bodied, this lush expression of Chateauneuf du Pape ends with layers of fresh, jammy black cherries. Silky, smoky, red berries, earth, ripe, sweet plums and spice deliver a supple, spice filled, fresh finish. From a blend of 70% Grenache, 20% Mourvedre and 10% Syrah, the wine opens with smoke, earth, strawberry and black cherry jam. Round and fleshy, the wine ends with ripe, sweet, black cherries. With 70% old vine Mourvedre in the blend along with 30% Grenache, the wine is powerful, concentrated, dark, young, meaty, spicy, tannic and fresh. Dark, fat, dense and intense, this blend of 80% Mourvedre and 20% Grenache serves up a potent brew of espresso bean, spice, black cherry liqueur and an earthy, barnyard component. Lushly textured and concentrated, this modern styled wine will appeal more to some tasters than others.